I am one tired mom. I have never been so happy for a weekend to end. I have been solo since Thursday while Daddy was in Phoenix for work. My daughter has been sick the last two days so we’ve been cooped up in the house, not a good scenario when you have to entertain a 4 year old active little boy who is constantly moving and bouncing around. Luckily I have great neighbors with kids the same age that he was able to play with a bit while I stayed in with little Gina. If I really think about it, I’m basically tired from doing nothing! I’m just so happy that Daddy will be returning tomorrow and things will get back to normal around here. I made these sandwiches last week before the big trip. My 4 year old son, Sammy, is a bit of a picky eater and doesn’t always like trying new foods so I wanted to stir up some excitement about dinner by telling him we were eating Sloppy Sammies that night. Boy, did that make his eyes open wide…he liked that a lot. Of course, he had no idea what Sloppy Sammies were, nor did he ask either. He happily ate his dinner that night. Yes it was that easy. Amazing. In large non-stick skillet over medium high heat, saute onions, carrots and red pepper until softened. Add ground turkey and continue to cook until browned. Add seasonings to meat and veggie mixture and cook through. In small bowl combine tomato sauce, ketchup, Worcestershire sauce, chili powder, mustard and brown sugar. Add sauce to turkey and veggie mixture and stir. Cook for about 5 minutes until sauce is warmed through and starts to thicken. Serve on whole wheat or potato rolls. So the trick is coming up with clever names for dishes, huh? I’ll keep that in mind when I have kids! 🙂 These look comforting and yummy. Hope your daughter feels better and your hubby returns safely! I hear you on the bursting with energy 4 year old! It’s great he ate his dinner. Maybe I’ll rename all of my dishes with their names to get them to eat!! Love these. Sorry about your rough weekend. It stinks when the kids are sick and the hubby is gone. I’ve been there. Yay for a healthier sloppy joe! Glad you enjoyed them. Sorry your daughter is sick 🙁 I hope she feels better! Glad the husband will be back soon! Oooh — sounds like you’ve had a rough few days! I hope things calm down for you soon. These sloppy sammies look great, and I LOVE your tricks for getting your picky eaters to eat! I love that these are called Sloppy Sammies! How neat that your son’s name fits perfectly with this! Fun stuff! I like your recipe, too; especially how you included shredded carrot. I need to embrace ground turkey on a more regular basis. This recipe is a great way to do that. Hope your little girl feels better soon, and that everyone else stays healthy. Have a great homecoming with your hubby tomorrow! Oops, Aggie, the above comment was from me, not Cayleigh (my daughter). She has an account on this computer for school, and I guess I need to learn to check the user name now! Sorry! I’ve actually been wanting to make something like this for a while. And of course, it must have been easy to convince Sammy to love this ha ha. Kids are wonderful. Glad you will have your other half back though – even when it feels like nothing, it’s a lot of work just being with kids. I commend you for being on your own those days. 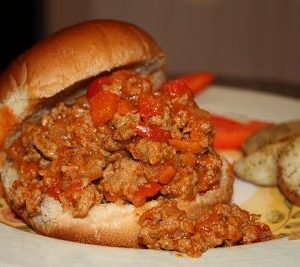 We call these sloppy joes….and until I met Grumpy I never heard of coleslaw on them…but I was amazed at how good it was! I’ll have to try out your recipe. I like the use of turkey making it lower fat! Rob loves sloppy joes and they make me skiv. so now maybe I can try out your recipe instead and make us both happy. Your are one clever lady getting your sone to eat his dinner! These look fantastic and I like that you used ground turkey. I’m so glad that weekend is over for you! It’s exhausting on your own, isn’t it? I always have renewed respect for single moms when I have to try to do it alone for even a day. I love that pic of your kids below; they are absolutely 100 percent adorable. I hope your little girl is feeling better! Everything looks so yummy, especially that baked brie way down on one of your posts! I’ve got a wheel leftover from Christmas. Thanks for the idea! These look really good. I redid my gma’s sloppy joe recipe earlier this year and used ground turkey. Don’t you love it? I would have eaten my whole dinner too – they look really tasty. Glad your hubby is coming home soon, I am sure you are exhausted! I will have to try these Sloppy Sammys for my 4 year old too. Excellent! Shame on me for missing this post!! I have never seen Sammies look like mere perfection!!! Sloppy.. I think not!!! The snaps are fabulous Aggie!!!! I second comforting and tasty.. It has been far too long since I last had sloppy joes! Those sammies look great!